To find an ATM in Italy, look for an Italian Bancomat with the affiliations you need (Cirrus, Plus, etc.) 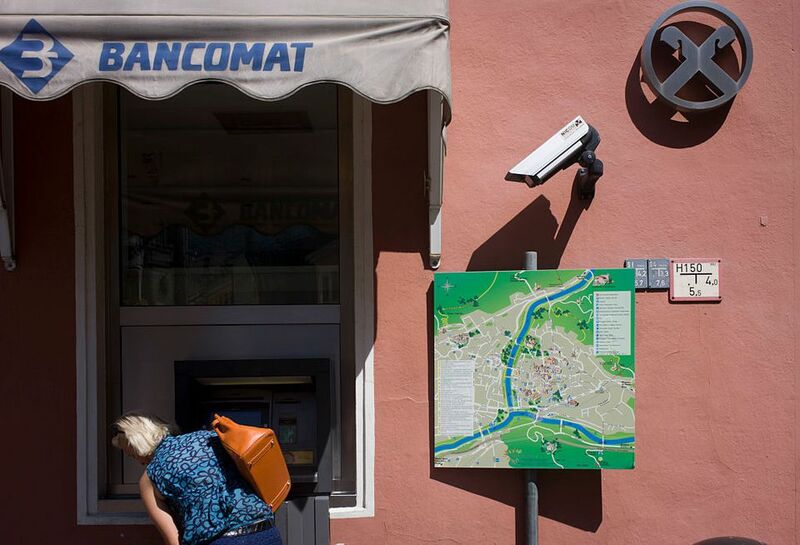 In Italy, Bancomats are clearly marked and are found outside banks, or in behind a door that opens when you swipe your card. You can also find Bancomats in airports and at train stations. Before you travel to Italy, check with your bank to let them know that you will be out of the country. This will keep your card from getting frozen. You should also find out what the charge is for foreign transactions on your debit and credit cards. Some banks charge a percentage, while others charge a flat fee, and some, unfortunately, charge both. These fees can change several times throughout the year, so you'll need to check for yourself before every trip. Don't waste your time or money on traveler's checks, as they have fallen out of use for several reasons, including that they can be difficult and time-consuming to cash, and you often lose money in the transaction. Once you insert your card, you will be prompted to choose your language. English will be one of the choices. Then you'll enter your four-digit pin number. After grinding away, you'll be presented with a number of choices for withdrawal. Choose the one that suits you. If you get money out, you're all set. At the time of writing, a maximum withdrawal limit of 250 Euro is imposed at most Italian Bancomats. Make sure your card can handle at least this amount in dollars. Remember, larger withdrawals are cheaper in the long run, especially if your bank imposes a per transaction charge. If you have trouble with your card, you will have to visit the bank during banking hours. Opening times can be inconvenient, usually, 8:30 a.m. to 1:30 p.m. and 3:30 p.m. to 4:30 p.m. Yes, you read that right, afternoon opening time is a scant one hour; go in the morning. If you exceed the amount your card allows you to withdraw on a daily basis, or your card has been somehow declared invalid in Italy, you are not likely to get an ATM message that explains anything to you. Your card will be rejected, perhaps with a terse statement urging you to contact your bank (but it will never explain the reason). Reinsert your card and try to withdraw fewer Euro. It's possible that the day's exchange rate made the dollar even weaker than it is and you've exceeded your bank's dollar maximum withdrawal. Make sure you bring at least two working ATM cards to Italy, both with four-digit pin numbers. In an emergency, you can get a cash advance from your credit card but this is usually an expensive option. Make sure you have contacted the banks involved and notified them that you're going to be getting money while in Italy. Ask them for a number to contact if you have a problem; toll-free 800 numbers are not free in Italy. Then, sit back and have an incredible vacation. What Is Italy's Evening Tradition, La Passeggiata?